Two years ago, when I was pregnant with my second baby, Mischa, I started keeping a journal, The Book of Things That Shall Come to Pass. Really it is just a stream of consciousness list of goals, plans, ideals and musings on how to achieve these things that shall come to pass. I have been sick with mono for the past two months - my illness has taken me away from so many things that are important to me. Through the boredom, guilt of being so unproductive and missing my former life, I found clarity in reading my journal and adding to it's pages. In the middle of September when I was deep in the worst part of my illness, Jesse came home at lunchtime to visit me. Waking up in the middle of the day put me into a confused panic. Why was I sleeping? Where were my kids? What was I supposed to be doing? He sat on the edge of the bed and listened to me cry about how pathetic my life had become. I couldn't even take care of my kids for a full day, I let my running fitness go, I lost contact with friends, I fell behind with my responsibilities on the farm, and I couldn't take care of our animals. Worse, I was selling their meat without being involved in their lives - just the separation I felt critical of in the meat industry. I had fallen so far from the balanced life I had worked hard to create. Just let it go, he said. It will all be there when you get better. The more you just let it all go now, the faster you can come back to it. Listen to your body and you will get better. Trust me. I am returning to running slowly. I have run a few short runs on the road and a few decent trail runs. My first time back on the trail was beautiful. The maple trees were dropping their helicopter seeds as I darted through the forest with the nimbleness of a deer. I took steady breaths through my nose as I plunged down steep sections of single track. Coming back up was a little harder but the burning in my lungs felt good. My passion for running is unflappable. I am more interested now than ever and my frustration and sadness have been channeled into a fierceness that I didn't have before. The Book of Things That Shall Come to Pass has a lot of new entries and soon I will be able to write completed next to several of the milestones. Within the next few weeks we will begin construction on our new house. It will be big enough for a piano. There is more than enough land for two horses - though I'm not sure how soon that dream will come true. Paavo counts to 10 in Spanish and my hair is almost down to my waist. I registered for a 100k race in February in California. After I finish writing this I am going to go start sewing matching dresses for Mischa and me. I've always been drawn to stories of plague. Through the sadness and fight for survival, the characters always realize what really matters in their life. The fragility of humankind in the hands of nature is strangely comforting at times when my own world feels all too heavy. Thankfully, I have never even been close to experiencing serious illness, but I have been sick. Viruses stop us on our tracks, steal our momentum, and make us change up our plans. My story of fragility started months ago, but I will begin with when I first learned about it. We took off Thursday afternoon before Labor Day to head up to a friend's cabin in Northern Wisconsin. On Friday morning the doctor called to tell me that I have mono and that I have had it since June. This serious virus that causes extreme exhaustion and flu-like symptoms can disappear and re-surface again if the patient is stressing their immune system. The fatigue can last for months. My world had been feeling heavy for a while, so an explanation was welcomed, but the diagnosis was devastating. My summer had started out with injury, then turned into racing success. After recovering from SI issues in May, I kicked off June with a 2nd place 20k finish. Then I jumped into moderate training for a 50 mile race in July. In the back of my mind I was planning to win the 50 mile but didn't want to set myself up for disappointment if it didn't work out - I had dropped out of my previous 50 for the injury. In the Dances with Dirt 50 mile, I took 1st in the female division and 4th overall. I had no problems during the race and recovered really fast. In retrospect, I could have raced a lot harder. I took a week off, then needed to decide what kind of training and racing I wanted to do for the fall season. Jesse, my husband/coach, and I decided that it was time to see how I could build on my Dances with Dirt win. I dove into a new training schedule that included back-to-back long runs on Saturday and Sunday (+/-12mile then 20+mile), several moderate paced 5-10 mile runs, and some speed workouts. I was averaging 60 miles a week - almost all on trail. After the long Sunday runs I was usually so wrecked that I had trouble sleeping or eating. I thought that the super humid weather and the new rigor of my training was just taking a little more out of me than normal. I started eating more carefully and getting to bed earlier. But as August went on I felt like I was using more and more energy just to get through my week. The kids felt harder to handle and managing the house became really challenging. Feeding the pigs and cows was such a struggle that I stopped doing it and moving stacks of vegetables took a lot of effort. This was hard for me because I have always thrived on a full schedule and have taken energy from balancing all of the things I feel passionate about. Toward the end of August, I couldn't even carry Mischa (21 months) up the stairs without being winded and I needed to sit down while getting dressed. Somehow I ran about 20 miles that last weekend When I finished my 12 mile run, I was shivering. My biggest fear in the decline of energy and running performance was Over Training Syndrome - a condition that afflicts endurance athletes. There is a little research on OTS, but plenty of anecdotal stories to scare me, it has been receiving a lot of press lately. If I was suffering from OTS, I was worried about my chance of competing on a high level in ultrarunning, because my training was not very intense or prolonged compared to elite runners. It would mean that I just wasn't cut out for the sport. I went to the doctor last week to plead for an answer that could bring me back to my former, vibrant self. I had an achy neck and back, inability to stand for more than a few minutes, a terrible headache, nausea, and chills. We talked through every possibility from iron deficiency to pregnancy. I gave so much blood that I didn't think I could make the 30 minute drive home. Two days later, I paced back and forth in the bedroom of the up-north cabin listening to the doctor list off all of the things that weren't wrong with me. But, you did test positive for mono. I'm really sorry. I pealed the phone off of my clammy cheek and sat on the bed. Denial, anger, frustration, and sadness passed through me on rapid fire causing my heart to flutter. When I put the phone back to my ear she continued on to tell me that I have had the virus at least since June. I had visited the clinic earlier in the summer to ask about painful lymph nodes in my groin and gave blood samples. Mono wasn't tested for at that time so I carried on without recovery. My recent bout of illness was my body's response to the stress of running. My current instructions are to rest for at least two weeks then return slowly to my activities. If I come back too fast, my body can't heal. Ultimately, I think this missed diagnosis in June was actually a good thing. If I had known I was sick, I would have taken several weeks off of running and probably not competed in Dances with Dirt. If I had taken time off or not raced, I would be done with the sickness by now but I would not have the same confidence I found over the summer. Also, knowing that I can be competitive and train really hard while my body is battling mono is awesome. What is important now is to actually let my immune system rest and fight off the virus so I can continue my training as a strong, healthy athlete. Getting sick is such a waste of time. But I need to be open minded and flexible because this will not be the last setback I experience. I am missing a 3 day trail race this weekend that I have really been looking forward to, Rock Cut HOBO Triple Crown: 10k, 25k, 50k. I still plan to race The North Face Endurance Challenge Wisconsin 50 mile on October 3, but I have adjusted my expectations. I had two other 50 milers on my schedule for October then December - the December one is still possibility. In addition to going for podium finishes at races, I had speed goals set for myself that will likely have to wait until I'm healthy. Setbacks happens for a reason and I will try to enjoy the down time. My family has rallied around me to help me get through this stretch of illness. Ultrarunning is just a sport and it's going to be there next year. I shot the mile 37 aid station volunteer a wily smile. I threw back my second cup of Mountain Dew and wanted more. I took the 2 liter from her hands and tipped it up to the sky. The plastic sides buckled under the pressure of my swallows. She leaned in close to me and said, Well Honey, you're our leading woman, now go catch those guys ahead of you. I had a several mile margin on the other females in the race so there was no fear of not winning my division. But I could possibly catch a man. I trotted out of the aid station and into the prairie section of the race, Dances with Dirt 50 Mile. I was on my second lap of the course and knew how hard this six mile exposed portion would be. The prairie radiated heat off of tall grass and the dirt was loose and sandy. After I zigzagged over rolling hills through the prairie for a few miles, I stopped and put my hands on my knees. I felt a wave of dread roll through my body - I was winning but far from finishing. As I stood up I tilted my head back and squinted at the sun. Tears and sweat streamed off of my face and into my hair. I still had 11 miles to go and it was only getting hotter. I dumped the rest of my water bottle over the nape of my neck. The cool water stung as it mixed with salt and flowed through my top, over my stomach, into my shorts and down my legs, burning all of the raw, chafed spots along the way. I took a deep breath in through my nose and blew it out through my mouth. Ok, Jonnah, just do your plan. So what was my plan? To win - I had reduced this 50 mile course to that. A few weeks before the race Jesse and I were driving back from the field after turning off an irrigation system. He glanced over at me and smiled. What? I said as we bounced over the rutted out farm road. Oh, nothing. Well, I have a goal for you. I think you could win the whole race. He meant an overall win - including the men's division. Why would you say that to me? You know that's impossible. I'm not even sure if I can finish. While I ended up finishing way behind the winning man, Jesse's wild goal, as unlikely as it was, stuck with me. I'm not sure if this was intentional but by putting me up to that feat, I decided that I would at least win the women's division - as long as my injury stayed at bay. Leading up to the race I didn't know if I would finish because I was still recovering from an injury that had caused me to drop from my previous 50 mile race. Back in January when I was planning out my race year, I was going to compete in the Dances with Dirt 50k event, not the 50 mile, but when I dropped out of Ice Age 50 Mile in May, I knew that I needed a redeeming race to reassure myself that I could be competitive in the 50 mile event. So there I was at Dances with Dirt 50 Mile leading the women's division by several miles. I had nothing left to do but race the clock for a strong finish time, and possibly catch some of the guys ahead of me. I was in a great position and was able to put myself there because my training was so specific to this race and the conditions I might face. Training on the trail: This was the first trail race where I had done almost all of my training on trail. I ran less often but the quality of my runs were much better than running on the road. For a month and a half I ran at Devil's Lake State Park, the location of the race, once or twice a week and I ran at Blue Mound State Park (just down the road from home) twice a week. I usually added in a 6-10 mile road run as well. My peak week was about 60 miles. In addition to having very relevant training, I also got super familiar with the course. I knew it well already, but learning how my body would hold up on challenging sections was very valuable. A lesson that I learned on a 23 mile training run was that my favorite descent, a 2 mile technical trail with a lot of opportunities to get air time, would destroy my quads. In the race we ran down and up this hill twice. On both descents, I fought back the urge to tear down the hill because I knew I could compromise my legs. It was a smart move, but I could have run faster on that hill, as well as others, and still had strength in my legs. Ultimately, I played it too safe, but during the race I knew that the only way I wouldn't win was if I was foolish with my pace. Heat training and management: July in Wisconsin can be really hot and humid. I raced the Dances with Dirt 50k last year and was very lucky with the weather - it was overcast with a 75 degree high. Those mild conditions might be one of the reasons I was able to come in second female overall. For this year's race, I wanted to be super prepared. I was sure to run on the hottest days, ideally during mid afternoon when the temperature was peaking and I was tired from the day. I knew that if I suffered in these grueling conditions prior to the race that I would have an advantage. I spent 20 minutes twice a week in a sauna at the gym. Sauna heat is very dry and easy to relax in for a few minutes. But once I got over 10 minutes I was pretty miserable. Pushing your body to acclimatize to the stress of heat can be valuable in a race. I am a big believer in sauna heat training, but advise that anyone seeking the benefits to consult a physician prior to starting a program. I run with an Ultimate Direction Jenny Running Pack to carry supplies that I need for most of the race. Jesse had the brilliant idea of leaving my pack at an aid station toward the end of the race to allow my body to cool more efficiently. At mile 37 I left my running pack in my drop bag and picked up my handheld water bottle. Taking off the pack, even though it's not heavy, made a huge difference in managing my body temperature. Fueling my delicate system: I have always struggled with eating during distances over the marathon (26 miles). In my past races I've had such bad nausea that even keeping liquids down is challenging. I took time leading up to Dances with Dirt to figure out what works with my stomach. Ask any experienced ultrarunner what the key is to fueling and they will all have a different formula. For me I found that I need natural sugars anchored with whole foods topped off with plenty of coke or Mountain Dew; Gatorade is good too. I ate 1 Honeystinger gel every hour for the first five hours, a potato dipped in salt at every aid station, some fresh blueberries, a few handfuls of dried cranberries and two pieces of dried papaya. I'm not sure how much water I drank, but I know it was too much. I guzzled soda whenever I had a chance. I still have a lot to learn about what is perfect for my body, but at least I can get through a 50 mile race without needing to throw up. Learning to improvise: The Dances with Dirt 50 Mile and 50k courses were changed last minute due to miscommunication between the race organizers, Running Fit, and Devil's Head Resort. From what I understand, it was handled as well as possible by Running Fit. I had studied the course map and elevation table very closely and was concerned when I learned, at 5:20am race day, that my course had been changed. Less than 10 miles were affected but the new terrain was very different. We skipped a climb at the beginning and a descent at the end, making the overall elevation gain lower. I imagined that this should make for an easier course, but the shady hills were replaced with burning hot, sandy prairie which really took a lot from me physically and mentally. This last minute change was a good exercise in improvising in a race setting. I am sure that I will encounter more uncertainties in future races. I was able to pass one man ahead of me at the finishing chute. He took a few seconds longer than I did to pickup his little girl. We both ran over the mat with our toddlers in our arms. I'm happy with my standing in the race, 1st female overall - 4th overall. I think that I was too conservative with my pace. I was afraid of running out of power so I held back knowing that I would win anyway. With every training run I do and each race I compete in, I learn more about my body and what I'm made of. I am looking forward to applying some of these lessons from Dances with Dirt to my next 50 mile - The North Face Endurance Challenge Wisconsin. I've always believed that the only path to being the strongest runner is through running. After a disappointing unfinished race last month, I have been reflecting on what this sport means to me and how I can be my best runner. While I have come up with more questions than answers, I feel that the meaning of all of this effort will continue to show itself to me in time. I threw myself into the ultrarunning world about a year ago and became fixated on running further and faster, with no thought to how I would feel about not meeting my goals. I rode the wave of strong race finishes all the way through this spring. Going into Ice Age 50 Mile I felt like nothing could go wrong and I should race as hard as I wanted to. My athletic image of myself was shattered when I decided to leave the race at mile 37 with debilitating hip and knee pain. I was so upset by how upset I was. Why did this sport mean so much to me? My reaction to the failed race was to see a full spectrum of practitioners and find a quick fix for my injury. I was treated by a chiropractor, alignment yoga specialist, sports medicine MD, and a physical therapist who performed an analysis of my running form. All of these experts helped me in different ways. The interesting overlap was that I needed to make permanent changes to my routine in addition to my short-term recovery plan. Some of my assignments were to sleep more, reduce stress in my life, wear a temporary brace to restrict the movement of my pelvis (IT belt), perform several pelvic and core stabilizing exercises and to STOP running. This was the real challenge - to stop running for two weeks. Unthinkable, unacceptable, inconceivable. But I did it! - well almost. I didn't run for 13 days. And when I came back, I did it slowly. First 4 miles, then 6, and up from there. Somewhere in this pause from running, I found a clarity that helped me loosen my grip on running. I learned that if took a more subtle approach to the sport, I wouldn't be hurt emotionally if races didn't turn out. And if I didn't have such a rigid expectation about my outcomes then maybe I would be injured less often. A month after I dropped out of Ice Age, I took 2nd place at Blue Mound 20k. This race is not a distance that I feel is a focus of mine, but the event had huge personal importance to me. 4 years ago It was my first trail race and to place 2nd after hitting such a low point a few weeks earlier was pretty awesome. After that race I fell into a gentle training routine leading up to my next race in two weeks - Dances with Dirt 50 Mile. I'm a little worried about the race. Most of my team of experts has mixed reactions to my race plan. I have been strongly cautioned not to continue running if I am changing my stride or have significant pain. How would I feel if I dropped out of another ultramarathon? I don't know, but I'm willing to find out. Sports are so vain. They are our culturally acceptable way of flexing our egos, as if to shout hey everyone, I'm better than you! But they are also an important exercise in humility, not only by losing sometimes, but by pushing ourselves to the brink of our physical abilities and surviving to talk about it. My weekly routine now includes not only running but yoga, an earlier bedtime, self massage, heat training in a sauna, Pilates, and plenty of downtime without thinking about running. My life has so much balance and beauty with running. I can continue to push myself in this sport as long as I don't let it ruin my personal happiness. Race abandonment, DNF (Did Not Finish), dropping out. These are different ways of saying the same thing: not completing a race you started. This is is something I knew would happen to me eventually. If you run enough races and put yourself up to challenges, it won't always work out, no matter how hard you try or how much you plan ahead. But I never gave much thought to how I would feel about walking away from an event - if you don't believe in your race, why bother starting? The week leading up to the Ice Age 50 Mile I had a dull ache on the lower right side of my back. I was familiar with this pain - I have struggled with sciatic issues since my first pregnancy. In the past, rest was the solution, so I didn't run for the 5 days before the race. Usually I would run 2-3 miles a few days the week prior to a competitive race, but opted to let my body try to mend. This race was the first time my husband, Jesse, and I had ever run in the same race at the same time. We ran the first 9 mile loop together and my body felt great. Between miles 10 and 18 I was flying high. I passed 4 girls and cranked up my pace with very little effort. I knew the race would start to get hard for me around mile 35, so I held back my urge to let myself cover ground too fast. A bit before the mile 20 aid station, my right hip began to ache. The muscles in my groin felt weak and I noticed my quads working really hard. A sinking feeling of dread and doubt hit me like a ton of bricks - this was way to early in the race to feel muscle fatigue. I stopped at the 20 mile station to refill my water. When I started up again, splintering pain in right knee kept me from putting all my weight on that leg. Once I got my momentum going I was able run through it and the pain faded. This portion of the course was an out and back which means that I came face to face with the leaders of the race and got to see who was in front of me and just behind me. The 1st place man, Zach Bitter, said 3rd place is just up ahead - go get her! Other runners exchanged encouraging words with me, Lookin' Strong!, Nice Race!, Hey, Great Job! Courses with out and backs are great in my opinion. For strategic purposes, they take the mystery out of who is where in the race. On trails, its really hard to know who is up ahead or behind, so being able to see a line up of your competition is very helpful, or discouraging at times. An out and back is also a fun way to connect with the other people in the race. Oncoming traffic often passes on narrow, single-track trails so interaction is necessary. Everyone is always super nice and these brief encounters takes the monotony out of running for so long. I carried on with hip and knee pain for 17 miles. I dreaded aid stations because if I slowed to a walk or stopped running, my right knee exploded into shards of glass. It wasn't the pain that scared me, it was knowing that I shouldn't be running. The fear of failure was much worse than any physical pain I was feeling. At the mile 37 aid station I was still the 4th female. I made quick work of filling my water bottles, grabbed a few potato chips, and downed a cup of Mountain Dew. I hobbled toward the trail with my knee and hip screaming in protest. Just 13 miles to go - I run 13 miles all the time. I could make to the finish and possibly even get top 5. My running coach buddy, CJ Lafond (who ran this race as a training run for the Kettle 100 mile! ), saw me as I made one last pause before limping onto the trail. Hey Jonnah, you alright? I explained to him that I couldn't really walk anymore but I couldn't leave the race. Sometimes you just have to swallow your pride and think about the rest of your racing season. He was right. There was no way to know how badly I was hurting myself and I could be compromising months of running and racing if I was running through that much pain. The energy of a race clouded my judgement and I really needed an experienced runner to help me make a sensible choice. Slightly pissed off at CJ for being right, I lumbered back to the aid station. I found the lady holding the clipboard. I need to drop out, I said under my breath. I'm DROPPING OUT! I can barely walk! I shouted at her. I wasn't yelling because I was angry at her, these were words that I could either whisper or scream, I couldn't speak them. Chunks of emotion swelled in my throat and I swallowed hard as she asked me questions. Do I need medical attention?, am I sure I want to do this?, should I just take a break for a while? I couldn't talk, so I just shook my head for yes or no. Jesse was a ways behind me at this point in the race. He is a pretty fast marathon runner and decent at 50k but 50 miles is a tough distance for him. I wanted to talk to him so badly so I waited in the aid station for him to come through. The girls I was ahead of all came by, I got smiles and waves and Are you ok?s. When Jesse came into the station, I pressed my face against his sweaty neck and began sobbing in deep, quiet heaves. He reassured me that I am a good runner (way better than him - he said), that I made the right choice, and how proud he was of me for doing the smart thing. You have 3 more ultras this year plus your other races. You are just getting started in this sport. At the finishing area my mom was there with my kids, Paavo (3.5 yrs) and Mischa (1.5 yrs). They came to watch me finish and I felt like I let my whole family down. I told them how I hurt my leg and I felt sad - that made sense to them. Over the course of the week, I visited my chiropractor, a sports medicine MD, and an amazing yoga therapist. They all agreed that my symptoms were textbook SI sprain. Additionally, I have a sprained pubis, the cartilage that joins the pubic bone. This is a joint that loosens during pregnancy and childbirth. The fact that I started running shortly after Mischa's birth may not have been a good thing. Anyhow, I will recover from my injuries and I will be back in the game within a few weeks. I know that I clearly made the right decision to end my race, but I feel a void where a strong finish was supposed to be. What I have realized is that a race is a culmination of training, so by not finishing, I have no closure or conclusion to the training period. A huge mass of tension builds inside of me in the weeks and months before an event. I use this tension to propel me through the race. When this part of the cycle is cut out, there is no release of that coiled tension. To manage this unsatisfying outcome, I have decided to put the potential energy into my next races. By abandoning the Ice Age 50, I lost no fitness, in fact, I saved myself from more recovery time. I start running again next week. I will build slowly and pay attention to my body. Longevity is key in ultrarunning so patience, discipline, and commitment will be what brings me success this season and years to come. I really like planning ahead. This is one of the reasons why ultrarunning is a good sport for me. I use a lot of my brain space to hash out what I will be doing weeks or months ahead of the current moment. I consider this aspect of my personality to be crucial to my success and happiness as a runner, business person, and mother. When I'm not in the thick of a busy racing period or it's low season on the farm, I'm scheming and laying out strategies for how to make the coming months filled with successful running. After a flurry of races in late winter, I had time to reflect on my goals for the upcoming racing season. What I learned after a strong 50k finish back in February followed by a national snowshoe racing silver medal in March, was that if I didn't plan my training more thoughtfully, my body would break down. I was racing at speeds that were above my fitness level. My mental will was much stronger than my physical body and I was paying for it after I crossed the finish line. I had a fever, cold sweats, and vomiting after my 3rd place finish at Sean O'Brien 50k and couldn't walk right for over a week after Snowshoe Nationals. My body was under-trained and filled with small injuries. Heading into the Ice Age 50 Mile race I decided to amp up my miles, do more cross training, and try to get more sleep. My new plan coincided with the start of our vegetable growing season, our beef marketing period and the arrival of our pigs. Running is very important to me but it is just a sport that I play. If I am smart about managing my time, I can make it all come together. With two running schedules to balance (one of us always stays with the kids), my husband I run whenever we can fit it in - in the dark, in the rain, hot, cold, tired, hungry, whatever - running in adverse conditions only make us stronger. Every day is a test of my physical strength and mental discipline. While I don't follow a formal training plan, I try to run several 4-10 mile runs during the week and back to back 10-20 mile runs on the weekend. Yesterday I ran 18 miles - today I ran 10. I have mixed feelings about all the hours I spend on the road. Lately, my brain has been slipping into a trance-like state for several miles at a time. I levitate off the road in a ghost dance of exhaustion. Maybe it's the boredom of running for so long or maybe it's the fatigue, but I fall into a lucid dream and wake up miles through my route. Training is not just about preparing my body for racing but bringing my mind to a place where I can find methods of coping with the mental stress of the race. My next race is 3 weeks out and I feel myself searching for some relief from the hours spent running. This is fine timing because I will start tapering off my miles this week. I will stop trying to achieve more fitness and allow myself to recover and rest. I plan to run most days of the week, just not the longer distances. After the race I will take a week off of running. I'll sleep and eat and get a massage. Then what? Back to training for my next race. Running is a game that doesn't end when the race is over. There is strategy in every decision I make throughout the day, everyday - how much I run, when I run, what I eat, how much I sleep, how far apart my races are. Every athlete is different so there isn't a formula for success, just observation and dedication to the process. Sometimes I wonder if I will ever get tired of ultrarunning. It is such an intense sport. Being an individual event, all of the passion comes only from me, not from the energy and accountability of a team. Maybe that is what I love most about it - I can harness all of the power inside me to try to be a leader in the race and not count on anyone else for my success - or failure. As long as I am injury-free and have the support of my family, I can't imaging loosing my focus in this never ending story. This is the first spring in 4 years that I haven't been either pregnant or recently postpartum. When I made the decision not to have anymore children, I was really looking forward to this spring. I would carry the momentum of my strong racing year right into the next, without any interruptions for pregnancy or childbirth. My childbearing years were some of the most important years in my life and shaped who I am today, but now I get so see what kind of athlete I can become. Back in December, Jesse and I registered for the Ice Age 50 Mile race on May 9th. This race is so popular that registration opens and closes in one day. This meant that we had to commit to our spring running plans half a year ahead. Signing up for this race was my way of finally acknowledging to myself that I was moving on from having a third baby and going straight into the next year of racing. When we got back from an epic running trip through Arizona, southern California, and Utah in February, I was excited to be home and put some major miles on back in Wisconsin. But, before we were even unpacked, everyone in our family came down with the flu. This started a spiraling virus pattern that we are still battling. The weather was bitter cold through February, not to mention how grey and dark it was compared to our sun drenched trails out west. 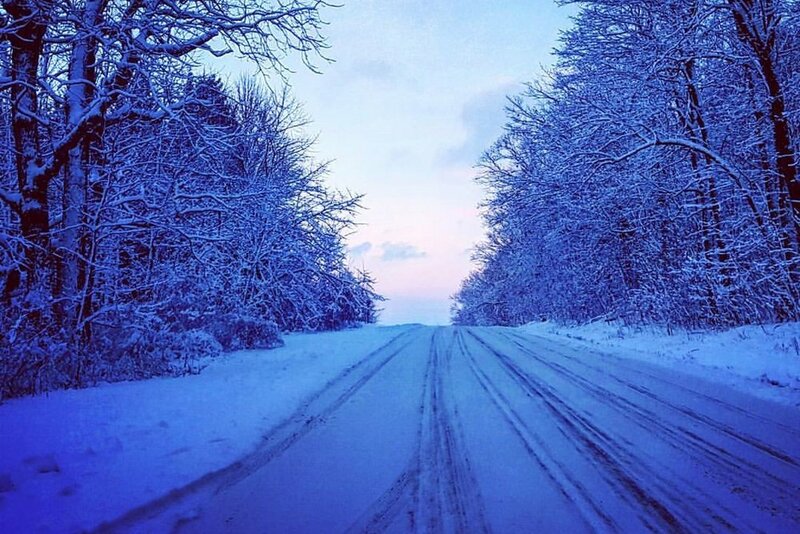 I grumbled as I layered on my running clothes and set out to run the snowy country roads around our house, every run was in the shadow of my beautiful vacation. The 20 mile radius around my house is set to the backdrop of rolling farm fields, grazing livestock, steep wooded ridges and valleys, and winding streams traversing the countryside. I know that I am lucky to live in this idyllic landscape, which only makes me feel guilty for wanting to be back in California. Finally daylight saving came a few weeks ago and I knew my running attitude would get better. Spring in Wisconsin can be very dramatic. One morning I wore long johns, overalls, and a puffy coat to work then ran in a t-shirt in the afternoon. Yes! Running would be awesome again and I was coming into spring in the best racing shape of my life. But as the snow melted, the roads were thick with salt and debris from the winter. The strong spring wind blasted salty dust into my eyes and passing cars and trucks left me in a swirl of sand and gravel. I decided to hit the mountain bike trails at Blue Mound State Park to get off the road. Then Jesse informed me that they are closed in the spring until they dry out, which could be a while because the snow is packed down all winter by snowshoers. How did I not know this? Because I started trail running after my first child, Paavo, was born and was pregnant that following spring. I ran through most of my second pregnancy but my runs never amounted to more than 10 miles a week. It is so strange to me how unfamiliar I am with running during the season that I was looking forward to so much. I am 48 days out from my next big race - Ice Age 50, the race that helped me move to the next chapter of my life. This is a critical time in my training and I will need to lay on serious miles over the next few weeks. One of the hardest things about running for me is not the running itself, but finding the time and inspiration to do the work. Running is about finding beauty in challenges, so I will let these long, windy roads be my test. I will rise above this awkward low point in the year to move out of the shadows and into the dust.